This has been a fun and full day for me. I tried a tea from Chado Tea room for the first time, so many options, its hard to decide which one to take. I am satisfied with my option though. 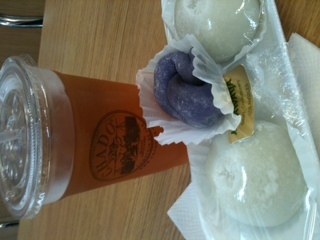 Now drinking it with mochi – perfect combo :). Happy Hour at Mccormicks is interesting as well. I normally order the buffalo wings and cheeseburger. However since I have been a vegan for quite some time now, it was weird not ordering it. Though the fries came with the buffalo/tabasco sauce instead of ketchup, so in a way I had a taste of it… The fried zucchini is excellent at this restaurant though compared to the downtown restaurant. Their serving is much more filling and satisfying.